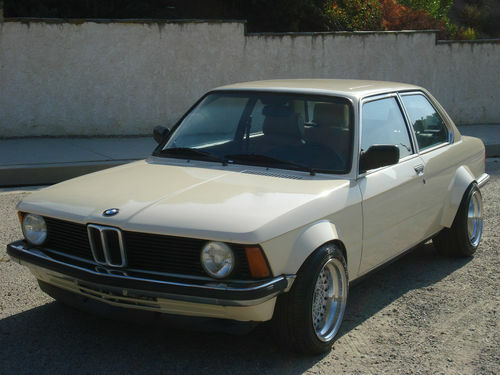 The 1975 E21 was the first of a long line of sporty luxury cars from BMW wearing the 3-series badge. It replaced the aging 2002 and introduced a much more modern chassis with rack & pinion steering and sold extremely well when new. Today, a well preserved E21 can be a fantastic bargain and offers the experience of a reliable classic that can be driven every day. 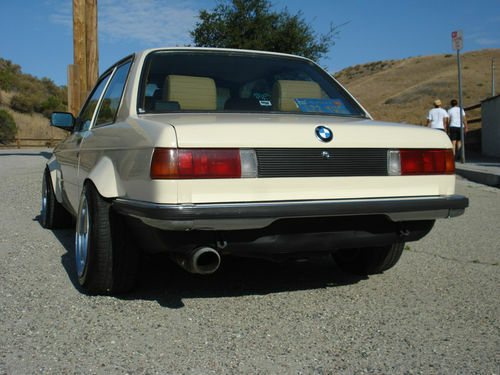 This 1980 BMW 320 E21 with M20 swap and hella-flush stance is for sale in Woodland Hills, CA, currently bidding on ebay for $10,000 with 4 days to go. First, we need to get the elephant sized flares out in the open; they are quite prominent and not really our style. They would be great on a race car if you were trying to fit some 10 inch wide wheels with 315mm tires front and back...but on a street car where the only reason is so you can run some insane offset...it's a bit silly. Regardless, the paint/body quality on the car looks good and if you are into the 'stance' or 'flush' look, it looks to be a nice example free from oversized graphics and illest stickers. 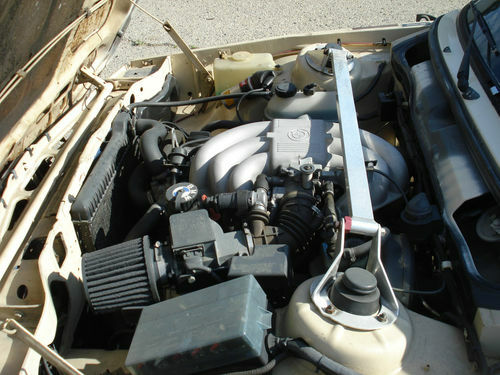 The engine bay has a later model 2.7 liter M20B27 inline-6 swapped in from an e30 or e28. The M20B27 was designated by BMW as the ETA engine - joking referred to as the estimated time of arrival for its low power ratings, it is actually a reference to the greek letter η, which is commonly used in engineering language for efficiency. The M20B27 would have produced 121 horsepower and 170 ft-lbs of torque stock, but could make a few more with the swapped head/cams indicated by the seller. 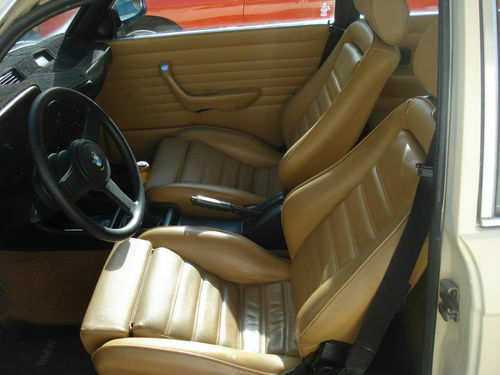 The interior of this BMW looks great for its 33 years of use - we expect it has either been thoroughly redone or spent most of its time covered. Thankfully, we spy a manual shifter sitting between the seats and this car has been updated with a later model 5-spd. It also has a swapped in Euro 323i rear subframe that includes a limited slip differential and disc brakes. Now here is where the details get a bit conflicted; the seller states that the swap is BAR approved but that it has headers with custom exhaust all the way back -- which isn't going to be smog legal in California. It also doesn't have a license plate installed on the back of the car, but it's got 1971 or 1972 issue California blue plate in the rear window - which would never have a legitimate reason to be on a 1980 vehicle. There are probably acceptable reasons that can explain our observations, but we'd want everything cleared up before putting down any deposit on this car. ~ love a 320i especially with big displacement and suspension mods but i ɛ the flares. ^^^what you did there, I see it and like it. This isn't quite the illest, but I can appreciate some of its details. And the flares wouldn't look as out of place with a better wheel and tire combo. Blue plates can be transfered to a newer car only if theyre personalized plates,and or you can always order them online with your existing lic plate # in blue and yellow.As said before wont pass legal smog,but we all know a guy who knows a guy sooo 200$ later you have the smog.But then again there are plenty of states that dont require smog check,and if the car stays in california the seller is responsible to smog the car by law(lol). I like the flares to but maybe with different wheels.The muffler has to go,maybe replace it with some period correct Ansa or Remus single or dual mufflers,or even magnaflow has a couple of models that would sound good on a straight 6. As far as the price goes,its been for sale locally for 10k for almost a year now. Looking at the bids,3 bids at 10k is telling me that its more likely a shill bidding,but I could be wrong.Either way its an ambitious build but not my cup of tea. ~ the flares are much too wide and have the look of someone's first foam-n-fiberglass experiment. the 323i rear subframe might have required added body width but wheel and tire choice is too 'boy racer', needs more tire or less wheel. when i detected airplane patches and hand-formed wheel lip edge-texture my immediate suspicion was concealed rust. and right where i most often see a 320i deteriorate. always a California car? i had a couple of these over a few years and aside from things such as brakes, shocks and struts, exhaust, alternator, injectors, which aren't [or weren't] big expensive changes the cars were dead-reliable. the seats look like Recaro or similar and comfortable.
. on second review of the engine bay i see the simplest strut tower brace i've ever seen. i'd like to know the manufacturer.